HVAC is shorthand for heating, ventilation, air and conditioning which is vital to a well-functioning office space. A well-functioning office is conditional upon the proper ventilation and comfort of the space. An important factor for any HVAC system to function is the cost and function of the system. Important features to consider when deciding on an HVAC system is the person who controls the HVAC and the design of the HVAC. An HVAC system has 5 basic air conditioning and 3 basic heating systems. There are 3 types of controls for the system: property owner controlled and maintained, tenant controlled and maintained, and finally property owner controlled and tenant maintained. A tenant controlled HVAC system allows tenants to operate the HVAC system at the hours of their choosing. Tenants are not charged for any overtime charges. This benefits businesses who work beyond standard business hours. The tenant is responsible for any water used in the system. Some systems operate on chilled water or condenser water. For a system that is air-cooled, the tenant is responsible for any additional electrical charges to operate the system. The unit is usually located within the tenant’s space and comes in 2 types of packages. One unit is either a condenser water or chilled water and the other is an air-cooled unit. A condenser unit or chilled water may require negotiations for any after-hours A/C usage. - Climate conditions (design temperatures). - Expansive use of glass – particularly in the South and West orientations. - High ceilings; increasing the conditioned volume of the space. - Outside air requirements; especially important in high occupant load areas like conference rooms and classrooms. Even residential structures are starting to take this into consideration. - Heat generating equipment; e.g. computers, copiers, laser printers, big screen TV’s, etc. - Lighting – especially the extensive use of incandescent and metal halide lights. 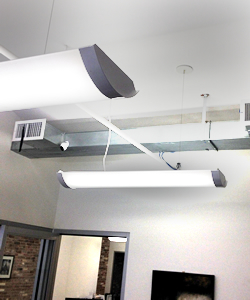 Fluorescent lights are more efficient and “burn” cooler – however, their ballasts generate a fair amount of heat. 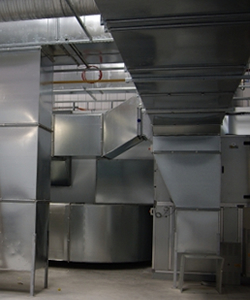 - Ventilation rates, with varying occupancy and space function, is one of the key issues seen in projects. In office buildings the need to support multiple and diverse occupancy needs is the most common difference between other types of buildings. Office building systems have more diversity in occupancy schedules, required ventilation rates, and functionality. Available equipment space is consistently being challenged to yield higher net to gross square footage. To understand HVAC (heating, ventilation and air conditioning) costs, it is important to have a general understanding of the type of HVAC system that will serve your premises. Particularly for companies that require 24 hour/7 day a week service, HVAC can be a substantial cost depending on the type of system. In addition, some companies may have critical HVAC needs, such as temperature control in a computer room. In these cases, special systems may be needed. Your HVAC cost is dependent upon two main factors: (1) who controls the system and (2) the structure of the system. There are three functional ways that the systems are controlled; five basic system air-conditioning systems and three basic heating systems. If the landlord both controls and maintains the system, the landlord will state standard hours during which it will provide HVAC. For example, Monday-Friday from 8:00am to 6:00pm and maybe some time on Saturday. If a tenant requires HVAC during other times, it will likely pay an hourly charge, often with a minimum amount of hours. The hourly charges will vary by building but can easily be over $100 to $400 or more per hour. If the tenant both controls and maintains the system, the tenant can operate the HVAC system during the hours it chooses. However, the cost here depends on the type of system. As described below, if the system operates on chilled water or condenser water, the tenant has to pay for the water, typically on a per ton per annum basis. If the system is air-cooled, then the tenant will typically pay only the additional electrical charges required to run the system. In some cases, the landlord will control the system and the hours of operation, but require the tenant to pay to maintain the system. Depending on a tenant's negotiating leverage during the lease negotiations, this cost may be able to be put back to the landlord. Today local laws set the standard in construction and as we move forward along new construction will help cement this standard. Humor aside - Tenant Controlled HVACible offices are out there - though finding the specific type can be difficult (traditional, medical, misc. ); ground floor, botique building, and older properties tend to be the situations where heating and cooling standards differ. If your interested in leasing or purchasing an office in Manhattan that features Tenant Controlled HVAC system just give us a call - we have data on all the building properties throughout city that bear superior HVAC systems, which charge for off hour use, and those that strictly schedule their environmental systems - let us help match you with the right space your looking for!